Christmas on the Blue is a Christmas Variety show with two full hours with some of the biggest stars of radio. The show includes skits, music, and more and is an excellent radio show to listen to get into the holiday mood. The show opens with a very festive rendition of the favorite Christmas song "Deck the Halls." One of the best parts of the Christmas on the Blue is the voices of WWII Military personal heard from overseas. Locations include Pearl Harbor, Paris, and the "European Battle Front." Families of servicemen could hear the voices of their loved ones from the WWII battle front. Truly a Christmas Miracle! 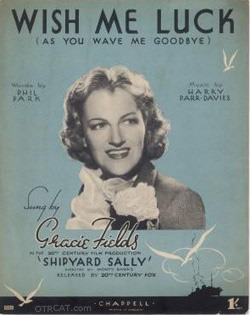 Wendell Niles serves as the announcer and Gracie Fields is the hostess. 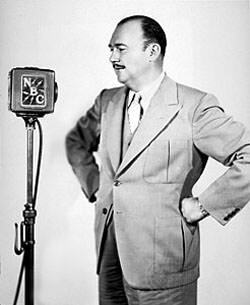 Guests of Christmas on the Blue include Paul Whiteman and His Orchestra, Walter Winchell, The Andrews Sisters, Alan Young, Andy Russell, Charlotte Greenwood, Ed Wynn, Keenan Wynn, and The Paul Taylor Chorus. Finding this site tonight for the first time has been wonderful.I live in the uk and have heard of many of these otr shows but never had a chance to listen to them growing up in England as I did and having our own OTR shows that I am more familiar with.I am slowly exploring and finding out the ones I like.So far Dimension X; X-minus 1 and the Ray Bradbury stories are my favourite.I hope next to try The Whistler and Black Museum.Its very comforting to know there are many others out there doing the same thing and its nice to feel you are all kindred spirits.Good Night.